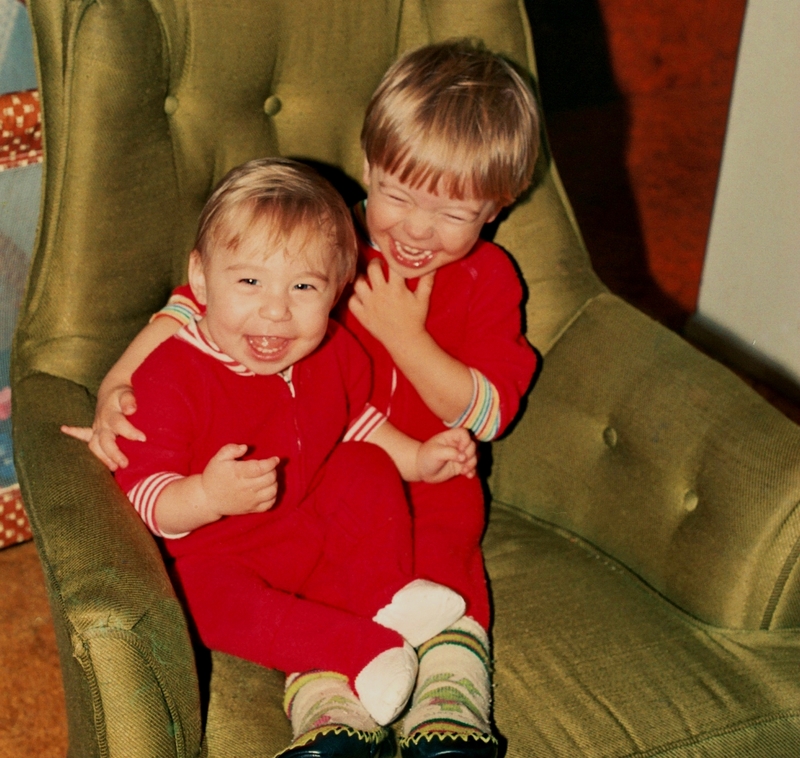 Matt and Drew in 1986, laughing together as they still do so often. Of all the things that have helped us survive the past thirty years, and even before that, I would have to say that humor is near the top of the list. I cannot count the times when a good laugh has lightened everything up for us. If someone asked me to name the trait I value most in both our sons, it might well be their robust sense of humor. Years ago when the boys and I were visiting my parents, we decided to take the MARTA train into Atlanta for some reason or other. I have forgotten what we did in town that day; what I remember most is something memorable that happened on the way home. It was right around rush hour in the afternoon, and our train was crowded. Somewhere between West End and College Park, after the train had gone above ground but was not near a station, it began to slow, grinding to a stop seemingly in the middle of nowhere. For a couple of seconds a hush fell over our car, and then something wonderful happened. As if on cue, almost everyone in the car burst into laughter. It was so contagious, it was hard not to join in. As we sat there — I don’t remember how long, but it might have been ten or twenty minutes — there was a relaxed, almost party atmosphere as people engaged in lively speculation about what was going on, and how long it might be before it was fixed. What surprised me most was the complete absence of any impatience, irritation or annoyance from anyone I heard. It was as if we were all caught as extras in some sitcom episode or comedy movie, enjoying it to the hilt. It was most unexpected, and makes me smile to this day when I think about it. The car eventually started up again, but the memory of that temporary stop lingers on. I’ve wondered about it a good bit over the years. Why did these people react with such spirited humor? I tell myself that maybe it was something about the relaxed good will of Atlanta (I can’t imagine that happening on the New York subway) or the southern African-American culture (we were the only white people in our car) or maybe it was just the sunny weather of a beautiful day in a lovely city. Whatever the reason, the experience left me indelibly impressed with the power of humor to turn bad situations into good ones. I hope you have had many such experiences, and will have many more. Feel free to share some of them in the comments! To laugh is to live. There’s nothing more relaxing and rejuvenating like laughter. For the experience part, I loved Rowan Atkinson’s Mr. Bean. You can’t resist laughter even if you watch it a thousand times. Everyone loves it. Hey, great tip, Sarvjit! I have never heard of Mr. Bean but I love British comedy and have always wanted to watch some of the Blackadder series. My sons are crazy about Monty Python and I think they are hilarious. Our younger son Matt loves to watch the BBC show “Keeping Up Appearances.” We are so lucky that we can see these programs from all over the world! Thanks again for the tip. Laughter truly is the very best medicine. Monty Python’s just amazing! Keep up the laughter. Thank you for sharing moments of your life. You’re welcome, thanks to you too! This post made me smile, especially because it’s snowing here and I could be frustrated with having to clean my car etc, but there’s something about snow that always makes me happy! I guess I belonged in Atlanta with you b/c I love to laugh, smile and enjoy snow! Great post! Thank you! I wish everybody I knew could have been in that MARTA car with us that day. It’s one of my favorite memories. I just couldn’t get over how it could have been an extremely frustrating and nasty atmosphere, but instead it was like an impromptu party. What the world needs now is more things to laugh at — innocent things that are not mean or snarky, but just happy! Egyptians have an enormous sense of humor even in the most difficult times such as what our country is currently going through since 2011. I try to find hope and comfort in every corner so it doesn’t affect our daily life, and my two children who don’t really understand what’s going on. I hate sitting around doing nothing and I love being optimistic, and try to find pleasure in doing something good or even looking at nature and beautiful scenes for relaxation. I believe that there is always light at the end of the tunnel. Thank you, Heba! I am so happy to know that you are able to weather the tough times through laughter. People who can laugh will stay strong. It’s so important to feed our minds a healthy diet as you describe. So often we worry about what goes into the body, but think nothing about what we feed our souls. I agree with you – there is always light at the end of the tunnel if we hang on in faith and hope! Thanks so much for joining us here! You are among kindred spirits! Thank you, Julia! It’s so kind of you to take the time to reply to comments. Very much appreciated! Heba, the pleasure is truly mine! I appreciate you being here! Julia, you’ve made me smile, as though I were aboard that MARTA car. Spontaneity at it’s best! Those moments can’t be planned, not to that magnitude. Our Murrells Inlet office is only 5 minutes away so we rode over, really to check scenery as much as roads. I thought of you, how much you would love seeing the marsh grasses covered with ice and snow. This coastal town is CLOSED! I really wonder what the “Snow Birds” (winter tourists) are doing! Take care my friend. The “Snow Birds” will at least have an interesting story to tell! I’ll bet many of them are snapping away with their cameras. Frozen marshes covered in snow would be quite a sight, definitely worth documenting and remembering. Thanks for giving me a vicarious visit! I drove back to Alexandria from Amy’s home in Manassas tonight with no problems. Her driveway and the surrounding woods are still covered in snow, as is all this area, but the roads are nice and clear here. My heart goes out to Alabama. Apparently they got hit even harder than Georgia and the Carolinas. Would you be laughing in your car today on 285 trying to get home in Atlanta? It does seem kind of humorous that a major city could be brought to a standstill by one inch of snow. Thankfully, I have not heard of any major injuries of loss of life. Michael, Drew told me last night that the sports radio DJ’s were spending all their time letting callers engage in therapeutic venting about sitting in frozen parking lots on the interstates in Atlanta. Eric was 8 hours on the road yesterday returning from visiting our parents, and Megan (our daughter-in-law) was several hours getting home from work. I doubt that even Atlantans were laughing yesterday, cheerful though they typically are. Since this sort of thing is so rare around there, they don’t have any of the equipment to deal with it. How did your son do yesterday? I imagine he was working overtime! There was one baby born in a car stuck on the freeway. Guess they have to name her “winter.” Or maybe Snowflake. Or maybe “Holly” or “Bianca.” If it was a boy, they could have named him Jack Frost! My wife, in laws, one of my kids were all stranded in various schools, hospitals, strange homes, caught completely by surprise from the ice and snow in Birmingham yesterday. I, on the other hand was warm, dry and comfortably ensconced in my fancy-schmancy hotel in San Francisco…now that’s funny! But now, I’m on an airplane headed back to Atlanta, the only to go of three other cancelled Delta flights. We’ll see how good my sense of humor is in about another 2 hours. Just love the picture…what a heart warmer it is! Thank you Jack, I’m glad you liked the photo. WOW, it’s hard to leave San Francisco even if one is traveling to an equally agreeable climate, but I am sure you are anxious to get back to your family, so I”m glad you were able to get a flight. I heard on NPR today that Alabama had really been hit hard, and Birmingham in particular. I hope things in Atlanta had improved a bit by the time you got there. The down side of having a generally mild climate is that when the odd winter storm hits, there isn’t much available to clear the roads and get things moving again. Thanks Jenelle, it always makes me smile, but I’m a bit biased! Hope your weekend will be full of fun and good humor. Oh! Your boys have always been beautiful people (inside & out)! I love this pix! Thank you Mary Ann, they certainly keep us laughing even now, as I’m sure you can imagine! Thank you Aunt Peggy, I wish you had been with us! You have laughed with us so many times over the years. I always loved it that you could get tickled just as much as we did. I have fond memories of going to Six Flags with you, and to see The Sound of Music with you in downtown Atlanta when it first came out, and I still remember all the times you laughed during that movie. What a beautiful photo. I wish we knew what they were so tickled about. I probable have told this story but when my niece came to Germany I wanted to take her to the birth place of Beethoven. We got on the train and soon the conductor came for our tickets. I gave him our ticket but he indicated it was not right. Through my little bit of German and the little help of the man sitting next to me I came to understand I did not have a ticket for that train and I was going to be put off at the next stop. The next stop was a platform in the middle of nowhere. There was no booth or anything. We all just laughed and laughed. What else could we do. Wow, how on earth did you get out of that one? That’s worse than when we got lost in France because the GPS didn’t know the road was closed. I remember being at the platform in Germany waiting for you and wondering if I was in the right place. I am glad I was because I would have had no clue what to do as there was NOTHING else there. It really is wild to me how many stops in Europe have NOTHING there at these platforms – no ticket machines, no attendants, not even any place to stand if it’s raining. It seems barbaric that they would put you off the train knowing there was nothing there, no place to buy the right ticket. It seems like they would have at least let you get off at a real station. I guess they have to do that or people would game the system. In Paris I was totally OCD about getting the right ticket to go with our Carte Orange, because I read that they would sock you with a huge fine if you didn’t have a ticket for the train you were on. So I guess it could have been worse! Raynard, I agree, I think we are meant to laugh! I honestly think that pretty much every single time I have ever ridden the NY subway – and it’s been quite a few times — something bizarre happens on the train at some point during the day and it cracks me up how none of it ever fazes the local people on the train. Once a man was playing the saxophone and asking for money which he claimed he would use to go into outer space “and take Ronald Reagan with me” (that’s who was president at the time). Another time a man was making loud speeches about how we had better beware because Hitler started out by making all the trains go backwards (he was sitting in a backward-facing seat). That kind of thing happens all the time in NYC and it always strikes me as hilarious or at least crazy, but nobody in NY ever seems to even notice it. Maybe they practice at home making poker faces in the mirror. Yes, snow in the south is a major catastrophe. The great thing about Jeff’s first assignment being in Dayton Ohio is that we did learn to drive in the snow and even in blizzards if we got caught in one, but I wouldn’t want to do it again. Stay warm! Glad you son was OK. My son was supposed to go on ambulance crew ; his part time job, but the ambulance never made it back to the station so he got to go home. Two feet of snow in Canton. He said he will take his bicycle in the truck with him in case he gets stranded. I think the Atlanta mayor might be in trouble and a similar occurrence in Seattle in 2006 led to the early exit of the mayor at the time. He lost the re-election. Michael, I haven’t followed Atlanta politics since I left home during the first term of Maynard Jackson, but I imagine it gets pretty lively. That was one thing I loved about living in NorCal, it was like a three-ring political circus, never a dull moment, and great fun as long as you didn’t stop to think about the depressing implications of it all. DC is the same way, one local scandal after another. Sometimes I think politics has become a spectator sport more than anything else. If I have time I’ll have to read up on what’s happening in ATL, and also about what happened in Seattle, since these type stories are more entertaining than fiction. I know nothing at all about Kasim Reed, but these weather situations are terribly easy to second-guess and sometimes I think it’s a losing hand for them no matter what; somebody is going to get offended or mad about something that was said or done, and look for a scapegoat. I’m glad I’m not in charge! Kasim has an interview on NPR this AM. “We are not prepared for these kind of events,” he said. And some will opine,”Why not?” I would not relish being in his shoes today. My son said the problem was so many just left their cars in place after running out of gas. I’m sure there will be lots of talking heads hashing things out, but it doesn’t seem realistic to expect a city to sink lots of money into maintenance and storage for equipment that might get used only every 5-10 years, if that. Having said that, though, it does seem that there should be some procedural guidelines in place that would prevent a sudden mass exodus of everybody at the same time. If Mayor Reed had let some people leave work/school before others, though, there would have been complaints about that, too. I don’t think anybody will ever be happy with how natural disaster-type emergencies are handled. Look at how angry so many people got at President Bush during Katrina, or President Obama during the gulf oil spill. I think in Seattle they called it the snowpocalypse. Bianca is a good winter name? As I was reading your post, I overheard a break out of laughter from the staff at the front of the building. How fun! That photo of your sons is incredible! Such happy, laughing faces! Thank you LB! I’m glad you had a real-life audio track to go with the post. 🙂 There’s nothing I find more appealing than a smiling face…unless it’s a laughing one! Thanks for being here. First off, what a precious photo of your boys, that is an absolutely treasured moment. You probably don’t watch Conan O’Brien (late night show, entertainment news and interviews) What I like about him is his self deprecating humour and he laughs like mad with his guests. It makes me laugh too. I also can really laugh at Gran-ma-ma on Downton Abby. The way she delivers a well written line is priceless, very understated and clever. I have often thought that many in my family (including me) might have lost what sanity we have left, were it not for laughter. Mr. B is lucky to have a friend like that. My siblings and I used to think of ourselves as the three stooges (when the fourth of us was still just a little baby) and I must admit, I think we still have many of their traits! I always love it when a comedian loses it and starts laughing right along with the audience. Laughter really is contagious. I simply MUST find a way to watch some Downton Abbey, it seems like it would be just the sort of thing I’d like. Is that the Maggie Smith role you are talking about? She is fabulous! The characters have each grown and changed along the way, so yes ‘linear’ is best. Top Drawer Julia (as they say).